1st October, 1986. A family of four arrive at Stockholm Arlanda airport, at 10am, bleary-eyed, carrying all their important possessions in old hardcase Samsonsite suitcases, about to start their new lives very far away from everything they have known in Bombay, India. Luckily, this deer-in-headlights family was greeted warmly by Alfred, a soon-to-be colleague and dear friend. He drove them to a corporate apartment in Vaxjo, our first home in Stockholm for the next couple of weeks. For this family, my family, everything about Stockholm was new, weird and intriguing. The air was cold and crisp. Dramatic white barren trees everywhere you turn. Cars bizarrely adhering to road rules. Landing up at the apartment, Alfred had to show my parents how to use the kitchen appliances which then naturally led us to ponder how to fill the empty cupboards and what to eat?? Once again, Alfred went above and beyond and took us to the nearest supermarket, Konsum. The food items were all in Swedish, and so many food items that were ready-prepared or frozen! At that time, this concept had not reached India. One of things that caught my mother’s eye were the frozen meatballs. Poor mans’ food in Sweden apparently but they looked sort of similar to kofte. 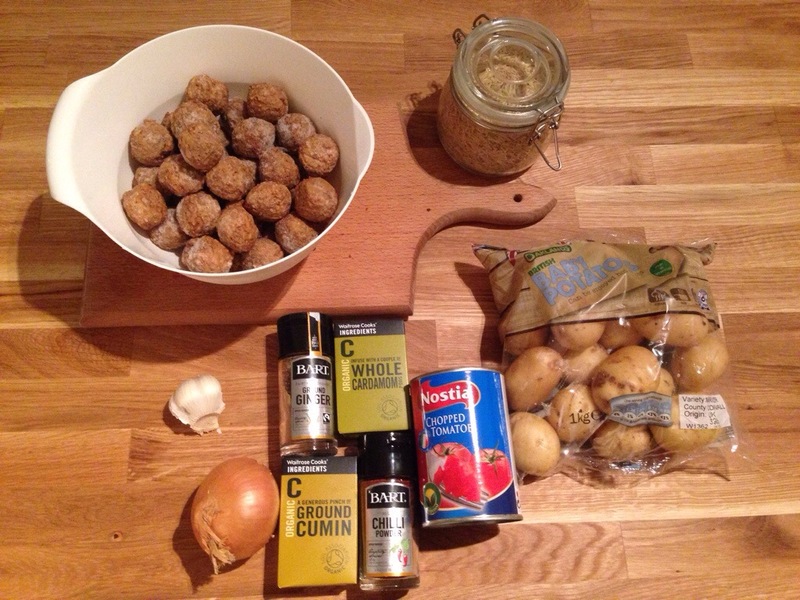 So along with some other basic food stuffs, my mother bought the ingredients for our very first meal in Sweden – kofte curry using Swedish meatballs. It’s now a little family charm that on the 1st October every year, whether together as a family, or in our individual lives, we recreate that evening, where four endearingly naive people huddle around a warming dish that is at once comfortably familiar and yet excitingly different. An ordinary day for many, but a quietly extraordinary day for my family. 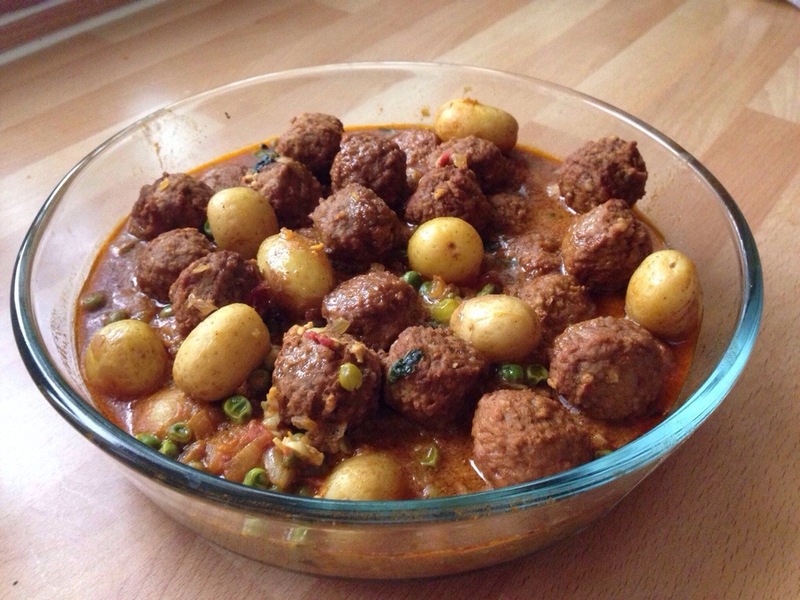 500g meatballs – love or hate Ikea (I’m definitely a lover), its meatballs in the food section are perfect for this dish. You can improvise and add some other vegetables such as frozen peas, carrots etc. to add more texture and colour. Perfumes may evoke and trigger over-romanticized and unreliable memories but for me, old television shows are much more effective. At this point, you will be scratching your head, an eyebrow will arch but bear with me. Didi (Bengali for older sister) and I were chilling this weekend (read: sitting in our parent’s conservatory mashing up our media or in more familiar words watching tv, Facebook stalking on our laptops, and texting on our mobile phones) when she came across a highly melodramatic, vaseline-tinted TV movie from the 80s on one of those cable channels that pats itself on the back when it gets 500 viewers. I believe it was called “Romance on the Orient Express”. Enough said. But for us, this movie was hugely significant. As my sister reliably recalls, this was one of things that had our rapt attention in our Sea Rock Hotel room in Bombay during our last few days in the city before we left for Sweden. I was not in the least worrying about what Sweden would be like. I was too busy thoroughly enjoying my plush surroundings. The first time in a fancy hotel room, glossy TV shows which hinted at other worlds and the revolving restaurant at Sea Rock. Seriously, tell me who would not marvel at eating in a revolving restaurant?? Bumping into this old movie made us think of all the stuff we used to watch when we were younger. The usual obsessions definitely obviously featured like 21 Jump Street and Beverly Hills 90210 (fyi, definitely in the Dylan + Kelly camp). However, there were four television shows which I will always identify with the early years in Sweden. Sinhá Moça (Young Lady) – a Brazilian telenovela about a slave-owner’s daughter set in Sao Paulo in the late 1800s. Looking back on it now, I probably only understood 10% of what was happening in the soap. It was obviously in Portugese and since my comprehension of Swedish was still at beginner level, the Swedish subtitles didn’t really help. Why on earth did we watch it? We were entranced by the high drama (would the Sinhá Moça ever get together with Rudolfo, the anti-slavery fighter? ), the gorgeous dresses and a sensual language we had never heard. The show was a gateway to a whole new world. Barnen i Bullerbyn (The Six Bullerby Children) – a Swedish miniseries based on the stories of Astrid Lindgren. This was pure nostalgia as it tells the story of a little girl’s life and adventures in the small and neat Swedish village Bullerby. It is the sweetest and most innocent story that is a throwback to a childhood which is more about good ol’ fashioned play, adventures and ‘scrapes’ instead of being on your nth diet by the age of 12. Ok rant over but you get my point. The show also reminds me of my childhood in Sweden. I was outside a lot. 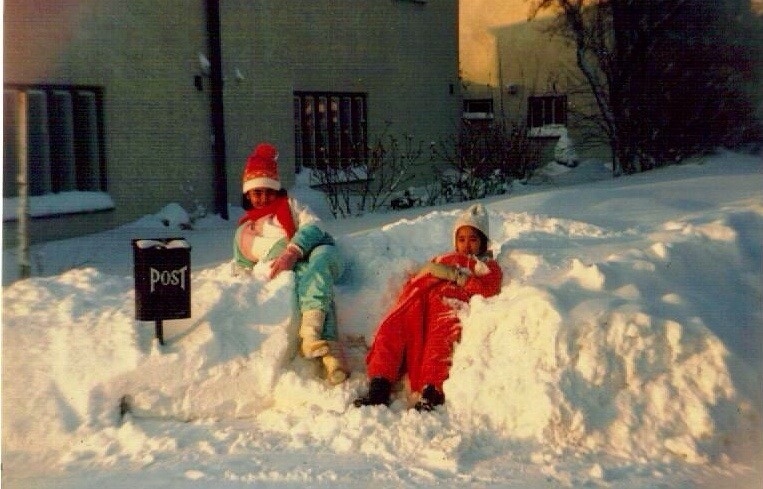 In the summer, it was about going on bike rides to the lake, grilling hot dogs, picking mushrooms and bluebells in the forest outside our house, swimming in Nalsta’s public pools and in the winter, sledding, making snowmen and climbing on top of the snow mountains stacked along the pavement. Good times. If Tomorrow Comes – another American TV mini-series. We recorded this on VHS tape so I watched it constantly. I used to come home from school, drink my daily glass of O’boy chocolate milk, do my homework, and then watch part 2 (inexplicably this was the only part recorded so until very recently I never knew about the first part!) in a state of bliss. Again, the glamour totally engulfed me. The big hair, 80s shoulder-pads, and the exotic locations. But the story was about a jewelry thief so Baba got a little concerned with my obsession and feared for my future. He needn’t have worried. My one attempt at stealing happened at our local supermarket was intercepted by the security guard and the humiliation henceforth made me never enter that shop and also crossed off larceny as a potential career. Eurovision Song Contest – Yeah yeah, I hear you snigger. But I promise that this show was a big deal in Sweden. It was one of the television moments of the year. My family were really nerdy about it. We used to all squeeze onto the sofa, tear out sheets of paper, armed with pencils and actually score each country’s song entry. This was back when there were only 20 or so countries in the contest and the political voting was limited to France and UK awarding each other the dreaded ‘nul point’. It’s funny to think of how these old TV shows have triggered family stories and memories. I really don’t think sniffing Revlon’s Charlie would deliver the same results.